(Notes on) Politics, Theory & Photography: A Photograph of Epochal Transformation? 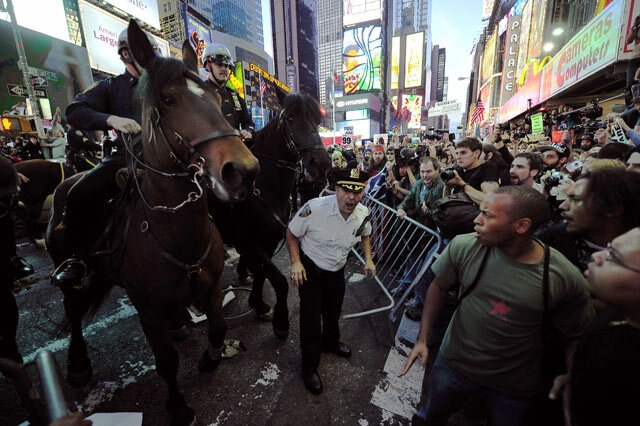 Occupy Wall Street participants in Times Square in New York. Photograph © Emmanuel Dunand/AFP/Getty Images. "In this photograph we see the end of that consensual age, which turns out to have lasted just 20 years, when the free market was essentially beyond criticism. The very use of the word "capitalism" seemed corny a decade ago. What was the point of applying such a term to a way of life that seemed to have no outside to it? . . . Capitalism is in trouble because of the very fact that people are once again widely calling it "capitalism" – with the implication that we can dissent from it." Well said. Read the rest of the essay here at The Guardian. Perhaps the neo-, or un-hyphenated, conservatives who proclaimed the end of history or countered with warnings about the clash of civilizations will have taken notice?